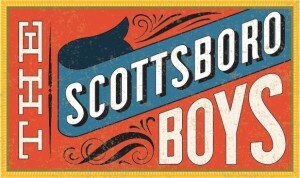 The Scottsboro Boys may be in its final week on Broadway due to disappointing ticket sales, but theatergoers packed the Lyceum Theatre for Thursday night’s performance. Following a sold-out show, in which composer John Kander and director Susan Stroman were in attendance, producer Catherine Shreiber introduced a panel of historians that lead a post-performance discussion of the historical importance of the Scottsboro episode. CBS News’ chief legal correspondent Jan Crawford took the stage, visibly moved by the performance, and announced that she was throwing out her prepared introduction. “I had prepared a little speech about how this [talkback] would illuminate the issues of law and injustice, because that’s what I cover, but I’m throwing all that out,” Crawford said. “This was a play frayed with humor, but I didn’t really laugh. For me growing up in the south, Bull Connor turning fire houses on peaceful protesters [feels like] just the other day. Sunday school girls getting killed in a bombing of the 16th St. Baptist Church [feels like] just the other day.” Crawford went on to comment how the nature of the Scottsboro incident shares parallels to today’s headlines. Following Crawford was Sheila Washington, the founder of the Scottsboro Boys Museum and Cultural Center in Scottsboro, Alabama. First learning of the incident when she was 17 when she discovered one of the Scottsboro Boys’ first-hand-account book under her parents’ bed, she was inspired by the story. “That little book, what I read about the Scottsboro Boys, the injustice that was done, overtook me to do something for those nine young boys.” Washington said. After years of funding and collecting artifacts (including the Boys’ jail-cell table), Washington opened the facility last February. Were you at the Scottsboro talkback, Rushers? What did you think of the panelists? Were your bodies all a-tingle just being in the same room as John Kander? Leave your thoughts in the comments! This show and talkback were some of the most intense experiences of my life seeing theatre. I am so, so happy that not only did I get to see the show before it closed, but that I was present to hear these people speak. It is incredibly sad that this moving, important show is closing. I was there. The cast is so talented, informed, and educated in what they are doing. You could tell when they spoke this a story they want to help tell. I am a southerner, I never heard the story, what a shame, shame shame. The worst shame is trying to stomp it down and keep it quiet. Education is the key to growing and changing.I hope this musical does travel the country and world. Tell it, get it out there. Mean time I am going to visit this little museum. Mrs. Horton Garret, it is ok to be southern and proud but it is not ok to think there is no racism. We all have work to do and the memory of these boys and their dear mothers is a great reason to do it.Thank you to Mr Kander and Ebb, Stroman and Thompson, you did it again. On broadway or not it is a true story that needs to be screamed to the masses. Over and over, may the boys’ memory never die. A TRUE WINNER! Interesting to see that my comments were taken as that I think there is no racism. My problem is that there is no mention of what some of the good people of our area did, mostly specifically my grandfather. If you haven’t heard of this story it is your own fault for not paying attention. There are NUMEROUS books, articles, movies, PBS specials on this. This happened in the ’30s, not last year. We have come a long way. That is not to say we all (and I mean everyone in the world) still have a long way to go on a lot of issues.